The lead veterinarian in the Yukon Quest is promising a team of vets will be 'at every checkpoint' alongside the trail. Nevertheless, the race is unable to shake a small group of opponents who accuse it of being cruel. The Yukon Quest — one of North America's most well-known sled dog races — begins this week, and mushers are busy making final preparations before hitting the trails on Feb. 3. Every year, a small minority opposes the race, as well as its cousin, the Alaska-based Iditarod. Most of the protests are online — but not all. Musher Luc Tweddell says last year, an activist started a shoving people at the Carmacks checkpoint. "We had someone come in who was against the race. He was insulting the participants and ended up pushing the judges. We had to get him removed. But, you know, there will always be that. It's part of the game, you might say," he said in French. Tweddell is running the Quest this year and says mushers take good care of their teams. "All you need to see is what the dogs look like. We work in symbiosis. If the dogs are doing well, the mushers are doing well. If people see that, it will give a good image to the sport," he said. Yukon's pj johnson — who spells her name in all lowercase letters — is one of the people who posts online accusing the race of cruelty. She admits her view isn't shared by most people in Alaska and Yukon, and certainly not fans and international media who fly in to cover the race. However, she believes she will be on the right side of history. "These animals are exploited and their treatment is inhumane," she insists. Yukon Quest mushers start with 14 dogs. They must arrive with nine at the end of 1,600 kilometres to remain qualified. johnson says it's clear there's a problem if so many dogs don't make it to the end. "The Yukon Quest has grown into an institution complete with corporate and government funding. It's huge. And I have to ask myself why are my tax dollars being used to fund legal animal abuse, which is is what I consider 1,600 kilometres [of racing]. Just because it's been going on for years doesn't make it ethical," she said. "I don't have a problem with mushing. My mother ran a trapline," she said. "But mushing is one thing. This is racing." Organizers of the Yukon Quest disagree with activists' portrayal, as do the veterinarians working the race. On Jan. 28, mandatory and public medical checks were held in Fairbanks, Alaska, and in Whitehorse. 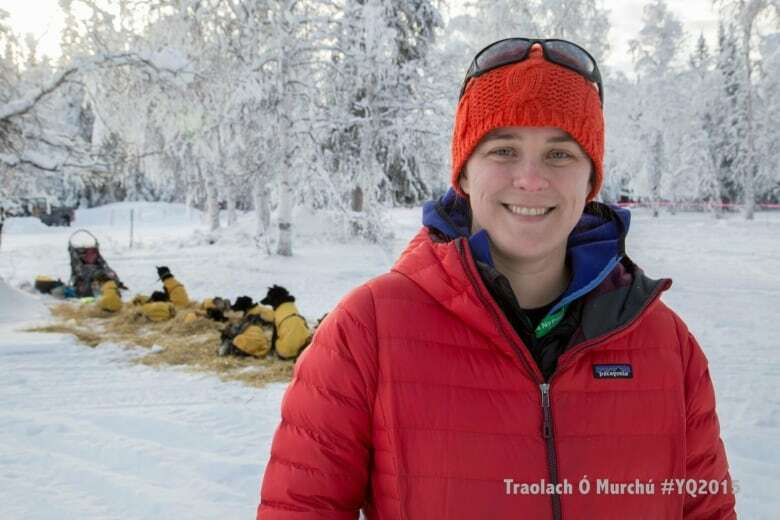 Dr. Jessica Heath, a veterinarian in Whitehorse, said her professional assessment is that mushers are taking good care of teams. She's been working on the Yukon Quest for ten years. "Generally all the dogs we see here look fantastic. They're in really good shape," she said. "[Running the Yukon Quest] is a tremendous investment of money and resources. They're not going to bring a dog to the pre-race check that's not in really good shape." Dr. Matt Allen of Whitehorse agreed the Huskies and Siberians were looking healthy before the race. "Occasionally we'll find a few muscle sprains or maybe a little bit of frostbite but in general, almost every team we check the dogs look great," he said. Some images shared by activists on social media don't show the Yukon Quest at all, but rather dogs injured at smaller community races. It is true that dogs die running the Yukon Quest. Nine dogs have died on the trail in the past ten years. Most of these cases have been due to medical issues such as heart malformations, internal hemorrhaging or sudden intestinal problems. Quest dogs have also died from choking on food, vomit or material, like pieces of harness. In every case, the deaths have made headlines and the causes investigated and publicly released. The deaths are a small percentage of dogs in competition. The Yukon Quest attracts between 18 to 47 mushers each year. This year, there are 26 mushers, registered with teams of 14 dogs, meaning there are 364 animals in competition . Nevertheless, johnson says the death rate is unacceptable. She also believes more dogs may be dying or culled after the race. "They sustain horrific injuries during the race that don't come to the fore until after the race and sometimes they die from it. Deaths go unreported," johnson said. Dr. Nina Hansen, lead veterinarian on the Yukon Quest, disagrees entirely with the anti-Quest activists. She insists vets take every precaution to ensure dogs are treated well. She says dogs are most often taken out of the race as a precautionary measure, and not because of serious injury. "I invite people who are critical of it [to see it]. Most of them have not seen a race," Hansen says. "It very rarely happens that we recommend a dog be removed and a musher disagrees. These dog teams are only as fast as their weakest link and if they have a dog that's struggling, maybe with a sore wrist or shoulder, most of the time the musher won't want to do further damage to that dog." This year, nine veterinarians will be following the entire Yukon Quest over 1,600 kilometres. Hansen says the veterinarians are part of a larger team assigned to animal care. This includes volunteers who help at rest stops and masseurs who rub down the dogs. This year's race will have four mandatory medical checks alongside the trail. "At those four places, every dog will get examined. Additionally, we are at every checkpoint along the trail to be there for any issues that arise with the dogs," Hansen said. Veterinarians can bring concerns to race officials, who have the power to strike a musher from competition. At the end of the race, members of the medical team will also vote on the Veterinarians' Choice Award. The honorary title is given to the musher who maintains the best care their dogs. Asked about opponents and their online campaign, Hansen said her experience and professional opinion tells her the race is safe. She says sled dogs in the Yukon Quest are the healthiest dogs she's seen. "[These dogs] are very well-behaved, very well socialized. They're handled everyday. They're doing the job that they're bred for. They love to run and anybody who thinks they don't love to run needs to come to the start of a race — or come to halfway point, or come to the finish. "These dogs are going to show up at the halfway point still pulling in their harnesses and ready to keep running." Mushing organizations are conscious of their image and public criticism. One example is the 2016 documentary Sled Dogs. The film, produced in B.C, tied for a documentary award at the Banff Film Festival, but was decried by mushers as biased and sensationalist. "It's always difficult to see images in the media like that," said Natalie Haltrich, who is the executive director for the Yukon Quest. "We have a responsibility to do better than the status quo, to always revise the rules to make sure the care of dogs is the top priority." For example, veterinarians must now sign a book held by the musher at every stop affirming they have reviewed the dogs. "It's our way for the Quest to put a stamp and say 'this dog can proceed to the next checkpoint,'" Haltrich said. "It's not a big change, but it proves the dogs are in a good state to continue."